Specialized Signs opened in 2009 and does more than illuminated signage – they also create window graphics, exhibition displays, banners, and vehicle and building wraps. The talented staff of 20 designers, sign makers, sign fitters, and vinyl wrap technicians, provide comprehensive custom-made signage and graphic solutions to organizations in Scotland and throughout the UK. 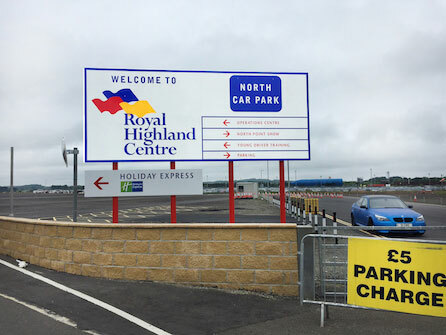 Recently Specialized Signs partnered with local Scottish charity, the Royal Highland Education Trust (RHET), to create and install a building wrap for a special charity event. The expansive signage will carry out its purpose of bringing awareness to farming and agriculture for young people. The RHET is a Scottish charity that works with partners to deliver learning opportunities to children by way of farm visits for schools, classroom speakers, outdoor education events, projects and activities, and more. Specialized Signs in Edinburgh donated their time and services to the organization to create and install several 20 by 10 foot Dibond aluminum composite panels. The signage went up at the Royal Highland Games site on the Glasgow Caledonian University campus. The public university in Glasgow, Scotland is one of Scotland’s largest universities with an estimated 20,000 students. 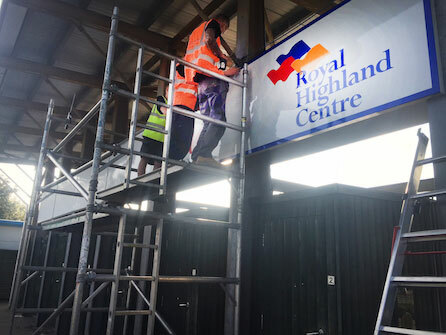 The building wrap for RHET was part of a job that needed to be completed for the Royal Highland Show; an event that occurs in June every year and accommodates over 300 school groups. The Scottish sign outfit worked hard to design and install the building wrap within strict time constraints. The project involved a large building wrap with vinyl graphics revealing images of students involved in the learning programs, and a large logo for the charity organization. Specialized Signs incorporated their branded logo on the roof of the building wrap in exchange for waiving the invoice fees. The Dibond panels were folded with the sign company’s flatbed applicator and over laid with vinyl graphics. The panels spanned several H-beams and were attached with over 100 12mm diameter drill holes. Dibond aluminum composite material is a durable outdoor signage material that can withstand extreme weather conditions without showing wear. The material can be manipulated, folded, printed on and mounted to create many signage solutions. The versatility, light weight, and long-lasting qualities of the aluminum composite panels are characteristics that help Specialized Signs to carry out top quality work.